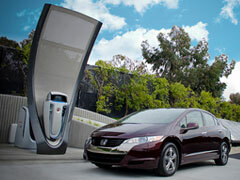 Honda has started new operations for the upcoming series of Solar Hydrogen Station first sample in the Honda R&D Americas, Inc. in Los Angeles. They have proposed an excellent use for home replenish products which are capable of refilling the fuel cells of electric vehicles overnight. It is a vertical unit, incorporated to be installed in the consumer’s garage. This new generation Hydrogen Station is making the smaller systems but producing more energy of hydrogen from filling in 8 hours during the night for everyday use. It will provide 10’000 miles in a round year to drive an electric fuel cell vehicle. There were previously designed hydrogen system that were more space consuming because they were coming with a separate compressor and an electrolyzer to produce more pressure hydrogen. It was very expensive and the compressor was a large component and eventually minimizes the systems performance. Honda has now removed the compressor from the new system, and this is the World’s first system can be used at home. It is also minimizing the size of other main components and improving the efficiency. It is now a pure compact version with improved capacity of at least 25% after calculations based on simulations. This is easily moveable by an average user and very easy to use its operations and can easily remove the fuel hose as well.